We get a lot of questions about whether or not castor oil is okay for curly hair. Another related question is what PEG-30 castor oil is (or any other PEG-#), and whether it is compatible with curly hair, especially for those on shampoo-free or shampoo-minimal routines. Castor oil is a plant-derived oil obtained from the seeds (castor beans) of the plant Ricinus communis. It is a mixture of triglycerides composed of several different fatty acids. It is a mono-unsaturated fat, with a one double carbon-carbon bond per arm of the triglyceride. The major component is ricinoleic acid, with the remainder of the oil being comprised of oleic, linoleic, stearic, and several other organic acids. 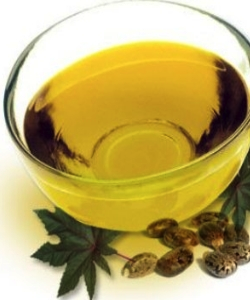 Castor oil is known for its excellent emollient and lubricant properties, as well as for its film-forming capabilities that make it useful in skin creams and in some hair styling products. The chemical structure of castor oil also helps it act as a humectant, so that it attracts water to the hair and skin. It has a relatively high viscosity, enabling a formulator to use it to thicken products, which can impart a more luxurious sensation for the consumer. One drawback of castor oil is that the film it forms has been found to sometimes feel a bit tacky or sticky to the touch. Also, if used on hair in its natural state, the film it forms on hair is not water soluble, which can be a problem for those who use low- or no-shampoo routines. This film can also have a tendency to attract other oils and dirt if not removed regularly, so it would be necessary to use a reasonably strong shampoo when you're using a castor oil product. The chemistry of the major component of castor oil (ricinoleic acid) is fairly unique among triglycerides. This unusual fatty acid possesses hydroxyl (-OH) groups on each arm of the molecule, which make it more polar than other fatty acids. The hydroxyl group also facilitates chemical modification of the triglyceride, allowing creation of derivatives with desired properties for many different applications.Molecular structure of PEG-modified castor oil surfactants. Surfactol 318 and 365 are trade names for products with different PEG amounts. One such derivative, frequently seen in hair-care products, is PEG-x castor oil (x = number of ethylene glycol units). Ricinoleic acid (castor oil) reacted with ethylene oxide produces a polyethylene glycol modified castor oil, with the number of ethylene glycol units varying from as few as two to more than100. The ethylene glycol portion of the molecule is hydrophilic (water soluble). This hydrophilic portion, coupled with the hydrophobic oil portion of the triglyceride, creates a nonionic surfactant molecule. These surfactant molecules can be used by formulators as excellent emulsifiers of conditioning agents, stabilizers, and thickeners. The ethylene glycol groups enhance the humectant properties of the castor oil molecule, which can be of help to curly hair in moderate climates. (Read this article for more information on humectants and curly hair.) PEG-castor oil molecules range from dispersible in aqueous solutions to completely water soluble, depending upon the PEG-#. When the PEG-# exceeds approximately 35, the molecule becomes completely water soluble. This is great for those on no- or low-shampoo regimens because there is little fear of buildup. Hydrogenated castor oil, also called castor wax, is the result of a reaction with hydrogen in the presence of a catalyst in order to remove the single double bond present on each arm of the triglyceride. This is done to make the molecule less susceptible to oxidation and spoilage. The result is a hard waxy substance that is highly insoluble in water. This wax can still be reacted with ethylene glycol and yields compounds with much the same properties as the non-hydrogenated varieties of PEG-x castor oil. As always, it is worth experimenting with a new product, especially if you have some knowledge about the ingredient and how it might impact your hair.